Most of my readers should be dyed-in-the-wool skeptics, right? Here’s the conference for you then – the annual New Zealand Skeptics Conference will be held in Dunedin this year, over Friday 31st August to Sunday September 2nd. Broaden your critical thinking to new areas and share your thoughts and experiences with others who care about sound information and improving everyone’s lot. It’ll be a good crowd. 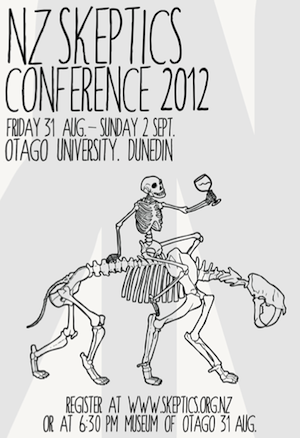 Registration is at skeptics.org.nz using the registration form or at the Otago Museum, 6:30pm August 31st. * There is a Saturday-only registration option for those who want a smaller bite of the event. Dr Michael Edmonds tells how to take your favourite** woo-merchant to task via the Advertising Standards Authority – and advertiser’s responses – apparently ranging the spectrum from calm to venomous to being completely bewildered. David Winter will teach the audience what every skeptic ought to know about evolution and some of the problems that occur in evolution/creation “debates”. Nick Barblich takes a look at chronic disease and how it trends from the medical to mumbo-jumbo. International scholar in medical law and ethics Associate Professor Colin Gavaghan will take a look at the thorny issues of patients who go to doctors demanding quack treatments and dodgy claims in peer-reviewed journals. Public policy and practice can take us from wellbeing to woo in fairly short order. Dr Mark Ottley says a healthy dose of skepticism assists avoidance of common pitfalls that arise pursuing wellbeing, whether for individuals or society. Entertainment for the Annual Dinner comes courtesy of Andrew Scott, Scicomm student, stand-up comedian, and presenter of the Bang! show. I’d offer to speak myself but for all my writing (blogging), I’m not sure what that I could say others would want to hear! The speaker’s topics are those from the skeptics website, lightly edited with links added. * Places at the dinner will be based on extrapolating from those who’ve registered online. ** That needs inverted commas, but that’s how it was on the skeptics website. *** Fraught to those who’ve tried their hand at it. It’s not an easy task to do well. **** To Be Confirmed. Not that you needed to be told. Should we teach examples of scientists falling for unscientific practices? Curses! It overlaps QMB again.